The “China Blue” dye you’re talking about, Dylon Permanent dye, would not wreck your machine, but using the machine would be a mistake for your project. In order to get the patchy appearance you’re looking for, you should use a small amount of water without stirring, in a plastic bucket, not the large amount of water and agitation involved in washing machine dyeing. Dyeing in the washing machine is only for when you want a single smooth solid color. The method you want is called Low Water Immersion Dyeing, which uses no stirring at all. 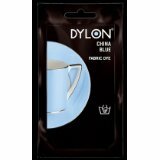 Dylon Permanent fabric dye comes in small packets suitable for dyeing a single garment in a small bucket. A single packet would not work at all in the large amount of water in a washing machine load. Diluting that quantity of dye with so much water would result in very pale colors. In addition, since the dye fixative is already mixed in with the dye, the fixative would be far too dilute to produce the high pH needed to work to fix the dye. Dylon Machine Dye, which is sold mainly in Europe, contains the same type of dye that is in Dylon Permanent Dye, but packaged with the dye fixative chemicals in quantities more suitable for use in a front-loading washing machine. You can use the instructions on the package of Dylon Permanent dye, with some alterations so that the color will be patchy rather than smooth. The biggest change is that you will not want to stir your fabric in the dye bath. Instead, you should put the sheets in a bucket (wet them first with water, and wring out any excess), mix the dye with the right amount of water, and pour it over the sheets. I think it would make more sense to order some Procion MX dye and soda ash (Australian suppliers include Kraftkolour, Batik Oetoro, Silksational, and The Thread Studio), but if you find it easier to access Dylon Machine Dye, you can alter their recipe to work. Dylon Permanent Dye contains mostly Drimarene K type dyes, which are good permanent fiber reactive dyes, very similar to Procion MX dyes except for requiring more warmth during dyeing. Before you buy your dye, first weigh your sheets, while they are dry, so that you can decide how much dye you need to buy. Be sure to use only sheets which are 100% cotton (or another 100% cellulose fiber, such as linen or viscose rayon, but no polyester or nylon), and do not use stain-resistant or wrinkle-resistant sheets, as these treatments will tend to repel the dye. Prewash the sheets in extremely hot water to remove as much as possible of the sizing and other finishes. Almost all sheets are sold with surface finishes that can interfere with dyeing, but pre-washing helps. 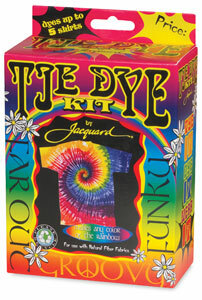 One packet of Dylon Permanent Dye will permanently color up to one-half pound (or about 500 grams) of fabric. This means that, for example, if you are going to dye six pounds of sheets, you will need twelve packets of dye. You will also need a sturdy plastic bucket or heavyweight plastic bin large enough to hold your sheets. The bucket does not need to be nearly as large, for the variegated results of low water immersion, as it does for dyeing a single smooth solid color, since far less water will be used, and you will not be stirring the sheets during the dyeing process, as you would need to do continuously for a solid color. “1. Weigh dry fabric. Wash thoroughly – leave damp. 2. Using rubber gloves – dissolve dye in 4 cups warm water – stirring thoroughly. For Low Water Immersion dyeing with Dylon Permanent Dye, dissolve each packet in about half a liter of warm or hot water, using enough packets for the dry weight of your sheets. Wet the sheets by washing them and letting them spin in the machine to remove excess water. Crumple the wet sheets evenly and place them inside a large plastic bucket. The tighter the fit of the fabric in the bucket, the greater the resulting degree of variegation. Dissolve the salt in hot water and pour it evenly over the sheets. Pour the dissolved dye over the sheets so that the level of the dye just barely covers the sheets, adding extra water as needed. Do not stir at all. Leave the bucket in the warmest place available for at least an hour; for the maximum use of the dye you have added, leave it overnight so that the dye reaction has time to go fully to completion. The dye-fiber reaction requires warmth, so do not leave the bucket in a cold room to react. After you have allowed enough time in a warm place for the dye reaction, pour the dye out (it is safe to dispose of in septic systems or sewer systems) and wash the fabric first in cool water and then two or three times in the hottest water available. It is most effective to wash out the unattached excess dye in extremely hot water, preferable over 60 degrees C (140 degrees F). Permanent fiber reactive dyes such as Dylon Permanent or Procion MX dye are not affected by hot water, even by boiling water, and hot water is best for removing the excess dye that has not bonded to the fabric. You can use different colors of dye in Low Water Immersion dyeing. You can mix them all together and allow them to separate in the fiber, or you can pour the different colors over different parts of the sheets. The colors will both mix and separate in an unpredictable manner. Mixing two colors that go well together, such as a clear lemon yellow with a medium blue color, will produce a many-colored result; for example, using a clear lemony yellow with a medium blue will produce some areas that are yellow, some blue, and some green. If you combine opposite colors, such as red with green, you will get browns and neutrals where the colors blend. For more information see my page “How to Do Low Water Immersion Dyeing”. For more ideas on how to warm a dye reaction in a bucket, see “What is the effect of temperature on fiber reactive dyes?”. This entry was posted in Drimarene K dye, low water immersion (LWI) on May 6, 2015 by pburch.